Today’s Blogmas theme is holiday decor. I have been collecting wine corks over the past few years, and finally decided what I wanted to do with them. 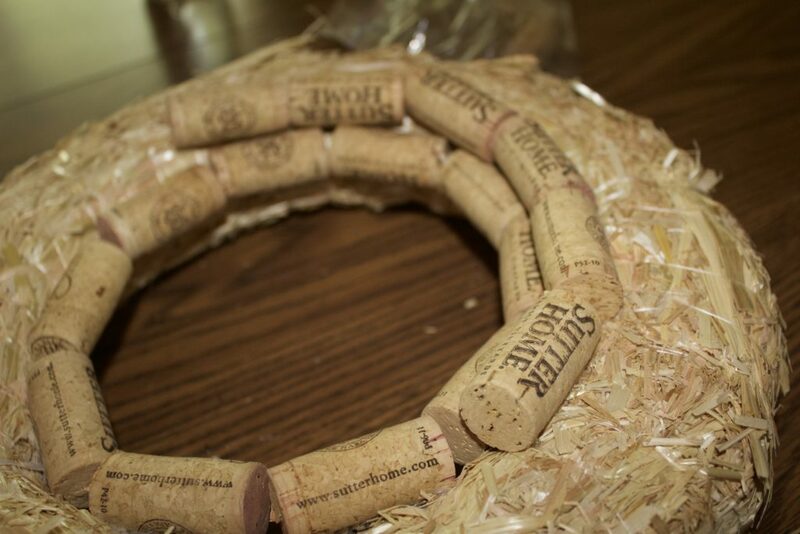 Christmas is my all time favorite holiday, so what better use for my wine corks than to make a wine cork wreath for the holidays. This doesn’t have to be specifically for the holidays, as you’ll see below. You can edit it to be used for any time of the year instead if you want! I am not really the crafty type, mostly because I just don’t feel like I have the time for it. 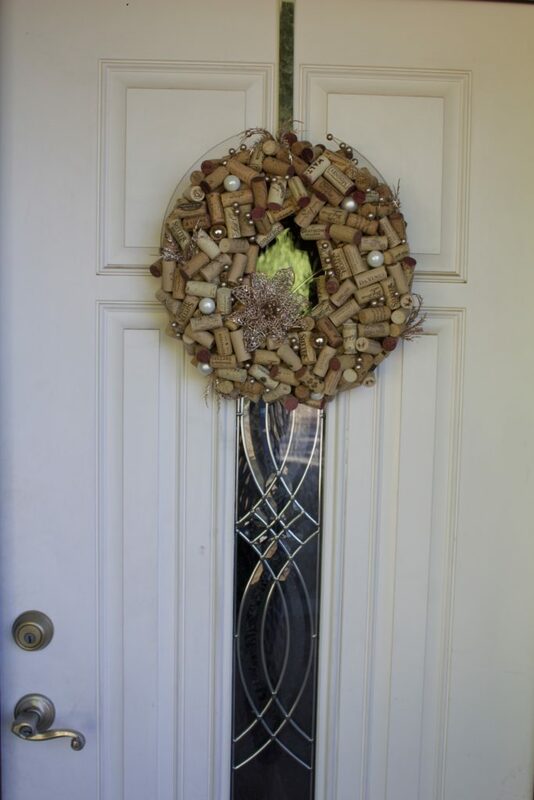 However, I love the idea that this will be hanging on my door throughout the season, because it combines two of my favorite things: wine and Christmas! Thanks to my mom for contributing to the cork fund as well:) Sutter Home anyone? This project is not for those that are impatient. I would say that it took me about 4 hours total to complete, and it was done in separate sittings because… kids. Begin by unwrapping your wreath. Some may suggest to leave it on, but I tried it this way and the hot glue just seemed to melt the plastic. So, I went with the unwrapped wreath. This will be messy, so I would suggest doing it on a surface that can be swept or cleaned up easily. LEAVE THE STRING THAT IS HOLDING THE WREATH TOGETHER ON. Cutting this off will make it so difficult to complete this project. Next, decide where you want to top of your wreath to be. Tie a pretty lengthy piece of ribbon or string around the top. I also hot glued mine into place. 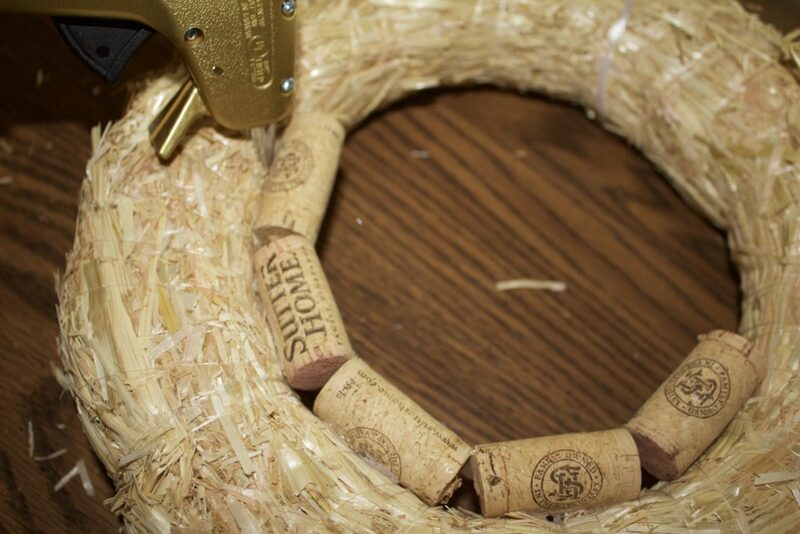 You want to make there is plenty of extra length, because the corks will add a bit of thickness to your wreath all the way around. This next part is pretty monotonous. 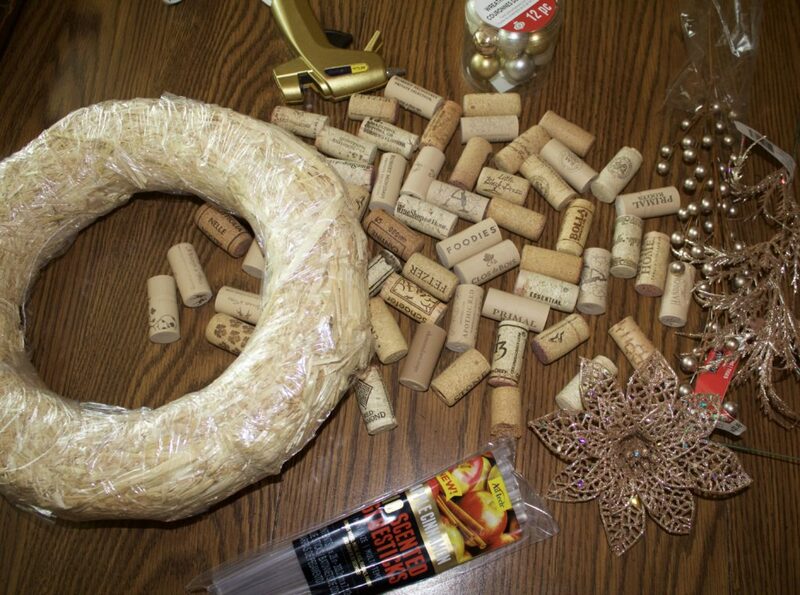 You take a cork, and place glue it on to your wreath. I started from the inner portion and worked my way out. You will continue to do this, one next to the other, all the way around. Then, begin on the next layer. For this part, there will be gaps and spaces in between the corks. It doesn’t really matter because the layers cover up these gaps for the most part. What corks you use, or whether the labels are out, only matter if you are going to leave it in this even layers format. If you are, you will want to make sure your labels are facing out or any special corks are in an easy to see place. If you are adding another randomized layer (see finished product), then this does not matter. You don’t need to worry about going all of the way around, because you will want to back to lay flat against the door where you are hanging it. You can leave it like this, add a flower or bow and call it a day. I wanted mine to be more random and larger, so I added another layer of corks and decor. If you are adding another layer, do not put any decor on yet. You will want to do the smaller decor items as you are adding in the next layer of corks. For this layer, the corks will be random. You will want the labels to all be facing the right way. I also liked the corks with red stains on the end to be facing out, because the bits of red added a nice color contrast. This is personal taste, so if you don’t like them then you can just flip the corks so the stained part is hiding. Start by adding in the corks randomly, at diagonals and verticals across the bottom layer of cork. Some of them will be facing parallel, but for the most part these corks will be random. 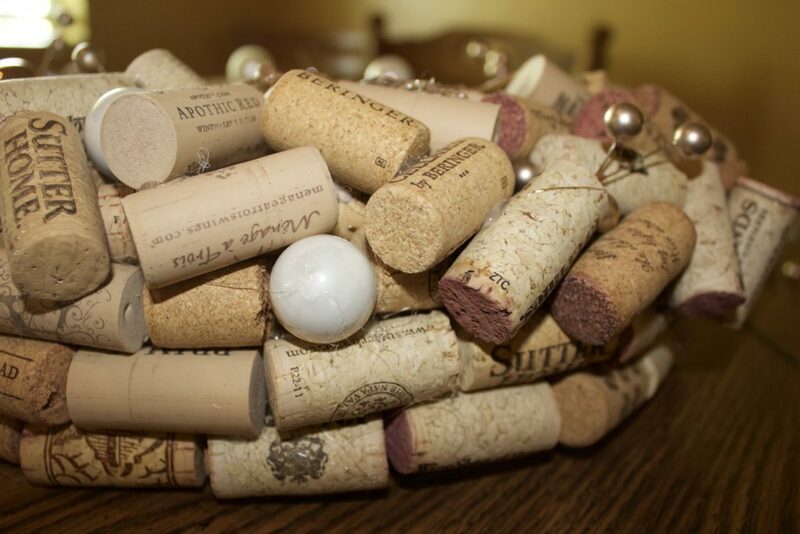 While you are adding the corks, add in the decor where you want if it is slightly bulky. I left a little room in between the corks where I wanted these mini ornament balls to go. 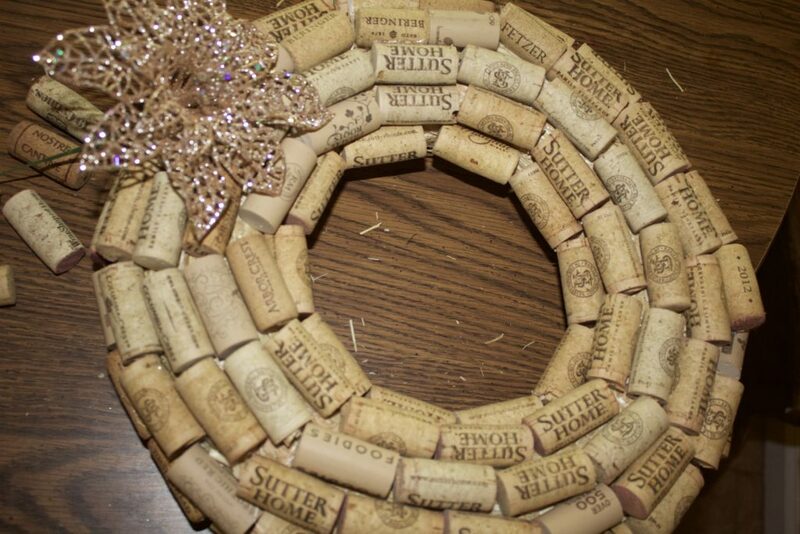 Some of the corks where placed at angles on top of each other so they were sticking out slightly, which I think gives the wreath a lot of fun dimension. 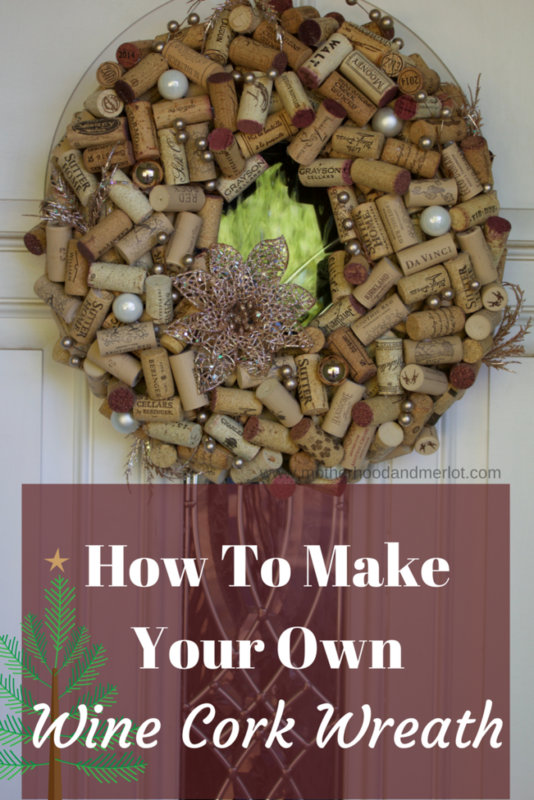 After all of the corks are placed and there is a full second layer around the wreath, you can go back through and add in more decor in spaces that seem blank, or remove some if necessary. I am in love with how it turned out and so proud that I stuck with it and took the time to finish this project. Then, hang it up and enjoy your hard work! I love this so so much and it turned out SO good! I want one… I could save the corks quickly! This is really cute! I love the random layer on the top; it makes it look so much more professional, I think. You did a great job! I have been wanting to make one of these. So excited that to have found this post! 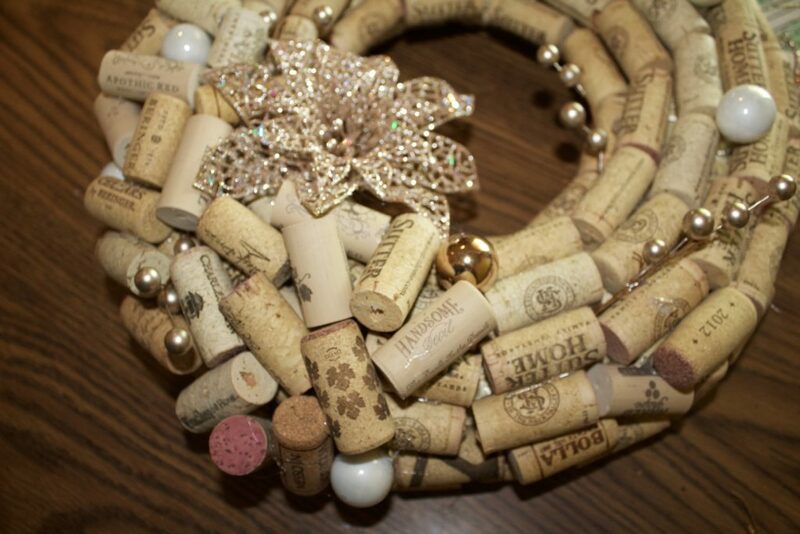 What a lovely wreath and how creative to use wine corks! I love the embellishments that you chose. Love the look of this for our bar! Now to get started collecting those corks ! Love it!! Now I have start buying wine with actually corks and not twist tops…. Omg I love how this turned out!!!!!! I really do need to get to crafting with my corks!!! Finally something fun to do with all of those corks! So adorable! Seriously though – this is gorgeous! I am beyond impressed with this…both with your commitment to drink the wine necessary to have enough corks to create this and to stick out the whole project. I probably would have given up half way through! This is such a creative idea and something I will definitely need to try! That turned out super cute! I don’t drink wine, but I know a lot of people that do and it would make a great gift!